This walk: 2012-12-5. 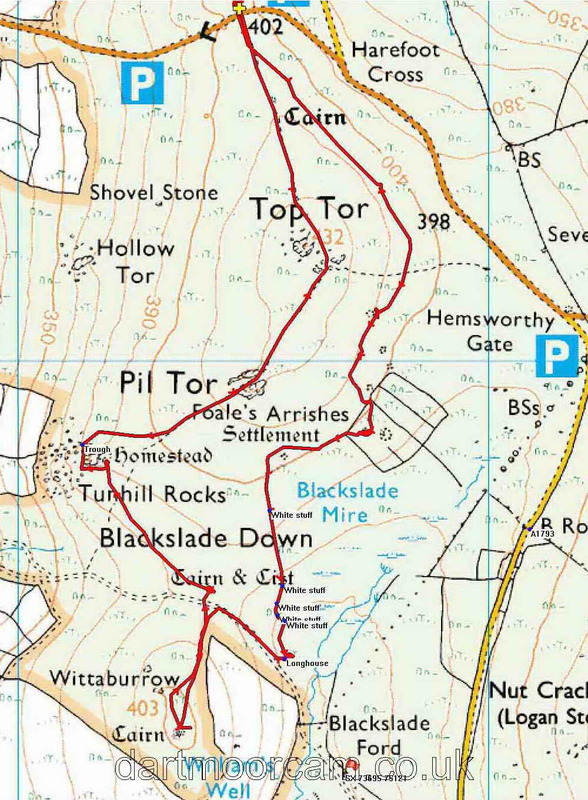 Top Tor, round houses / hut circles, Rippon Tor, Saddle Tor, Haytor, Foale's Arrishes, reeve, pixie snot, Blackslade Down longhouse, Whittaburrow cairn, Warren House Inn, Blackslade cist, Tunhill Rocks, Pil Tor, Widecombe, St. Pancras Church. Link to Google Satellite view of the area - the car park is at the centre, top edge of the view, the southern extremity of the walk is at the rocks at centre, 25% of the distance from the bottom edge. Another view of the rock pile at the left in the previous photograph. Zoomed view to Rippon Tor, SX 746 755, elevation 473 metres (1551 feet). Zoomed view to Saddle Tor, SX 751 763, elevation 428 metres (1404 feet). Haytor (Low Man) left, SX 757 770, elevation 457 metres (1499 feet). Same round house as shown above. Old hedge outlines in Foale's Arrishes: Foale was the last inn-keeper of the old New Inn (long since defunct), the remains of which are possibly in the background of this photograph. "Arrish" is an old name for a cornfield or stubble field. The ruins are illustrated on a different walk on 27 May 2010, where they are described as "old building" and "Newhouse, an old inn" - possibly confused with the similar name for the original inn where the Warren House Inn now stands (across the road from). The same hut circle with Haytor and Saddle Tor in the distance. Pixie snot, Star jelly or "White stuff" (on the map below) ..... possibly something to do with a female frog's egg-laying system going wrong or regurgitated frog spawn material from a bird or mammal? Found at SX 73537 75683. There is a explanation in a radio interview recorded on the BBC Radio 4 : Saving Species programme (from Series 1 Episode 36, broadcast 4 January 2011). More, at SX 73563 75522. Other samples were seen at SX 73552 75484, SX 73555 75461 and SX 73569 75448. Medieval longhouse ruins, at SX 73571 75375, beside the old road, looking uphill, described in J. Butler (1991), Dartmoor Atlas of Antiquities Vol. I, 9.14 Blackslade longhouse, page 62 ..... very long, measuring 17� by 3 metres (61 ft x 14� ft). The shippon, where the animals were housed, is downhill (for drainage) and is nearest the camera. Zoomed view to the Warren House Inn, a hand-held, maximum zoom, photograph with camera shake, with Hurston Ridge behind and Assycombe Hill and the trees of Fernworthy Forest in the distance. Another view of the cist giving some impression of the large cairn that it was covered by. There is a reeve from the cist to Tunhill Rocks. Approaching Tunhill Rocks, SX 731 757. Pil Tor, SX 734 759, elevation 430 metres (1410 feet). Zoomed view (rested on a rock!) to St Pancras Church, Widecombe-in-the-Moor, known as "The Cathedral on the Moor", showing the church yard and the lich gate (left, by a tree). Walkers disappearing over Pil Tor. Photograph taken after Tunhill Rocks and approaching Pil Tor, looking left i.e. west or north-west-ish(? ), ridges and furrows, believed to be on Wind Tor - we'll have to go back and look again. Rock pile at Top Tor, SX 736 762, elevation 432 metres (1417 feet). Another section of Top Tor. The walk was reached using the Bovey Tracey-Widecombe road by some, or from the A38 using the "Widecombe" turn-off at the Ashburton - Newton Abbot turn-off. There are other approaches. Parking was at the Harefoot Cross car park, indicated by the P symbol and yellow cross at the top of the map. Distance - 5.01 km / 3.11 miles.